According to the study, which was prepared by the Pembina Institute and the David Suzuki Foundation, with significant input from the economics modeling team at M.K. Jaccard and Associates, Canada makes it to 2020 pretty well, overall, even if it implements serious emissions-reductions laws — the kind consistent with a global strategy required to keep average temperatures from rising more than 2 °C above pre-industrial levels. Canada’s GDP is projected to grow 23 per cent between 2010 and 2020, or an average of 2.1 per cent annually, while meeting the 2°C emissions target. By comparison, under business as usual conditions, Canada’s GDP is projected to grow 27 per cent between 2010 and 2020, or an average of 2.4 per cent annually, with GHG emissions in 2020 rising to 47 per cent above the 1990 level. GDP growth rates vary significantly among regions, as is the case under business as usual. The article goes on to mention that while Canada as a whole does quite well, the tar sands don’t, which may make taking action difficult, at least politically. Ask a random sample of journalists whether our top scientists agree on the basics of climate science, and they’ll surely say yes: Greenhouse gasses are warming the Earth, man is the cause, and we have to reduce emissions, or else. But ask the same journalists whether our top economists agree on the basics of climate economics—the costs and benefits of addressing the problem—and they’ll almost certainly say no: There’s no comparable consensus among economists. The second area of consensus concerns the short-term cost of climate action—the question of how expensive it will be to preserve a climate that is hospitable to humans. The Environmental Defense Fund pointed to this consensus last year when it published a study of five nonpartisan academic and governmental economic forecasts and concluded that “the median projected impact of climate policy on U.S. GDP is less than one-half of one percent for the period 2010-2030, and under three-quarters of one percent through the middle of the century.” (That’s a lot of money—U.S. GDP in 2007 was $13.8 trillion—but Stavins has estimated the cumulative cost of all U.S. environmental regulation to date at 1 percent of GDP, and it has not been an insupportable burden.) Stavins’ climate-cost calculations come in a bit higher than those in the EDF study, ranging from less than 0.5 percent to 1 percent of U.S. GDP; he describes these as “signiﬁcant but affordable impacts” that are “consistent with ﬁndings from other studies.” The Stern Review on the Economics of Climate Change, an influential but controversial 2006 report for the British government, concluded that climate action would cost 1 percent of global GDP (though Stern now warns that our failure to act is raising the price tag) and that inaction could reduce global GDP by up to 20 percent. You can’t take any of these forecasts to the bank—economic models are notoriously bad at predicting the future—but by aggregating them, as EDF did, you can get a general idea of the impact of climate action. It won’t be free. And it won’t be anywhere near as bad as the economic contraction we’re living through right now, in which U.S. GDP fell by 3.8 percent in the fourth quarter of 2008 alone. A consensus among economists does, in fact, exist. Just not the consensus the denialosphere would like people to believe. Earlier this week, J. Scott Holladay, Jonathan Horne, and Jason A Schwartz from NYU’s Institute for Policy Integrity published a survey of economists on climate change entitled “Economists Climate Change: Consensus and Open Questions.” Their findings support an under-reported piece by Eric Pooley from early this year about the failure of the media to accurately convey the economic position on mitigation. 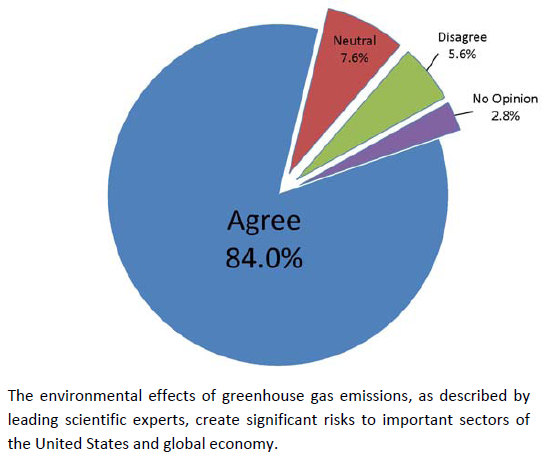 The United States should join a global regime to reduce emissions, with a majority of economists saying the United States should commit to emissions reductions regardless of other countries’ actions. The survey also found that there is no consensus that the future costs and benefits of climate change policy should be discounted at a constant rate, with an equal number saying that alternative discount methodologies should be used, and a significant percentage stating that alternative moral inquires were the most appropriate way to approach intergenerational questions. That last bit is striking. There are those who fancy themselves non-denialists who oppose mitigation on economic grounds based upon narrow readings of economists like Nordhaus- Jim Manzi comes to mind. Manzi and others’ argument against action essentially hinges on the discount rates assumed, portraying their analyses’ choices as mainstream. This survey reveals that rather than being mainstream, there is no consensus on Nordhausian let alone constant discount rates, and those favoring non-constant rates discounted the cost of climate change at a substantially lower rate (i.e. more heavily favoring expenditure now rather than passing the costs off to future generations). The third finding listed above, though, is the one that needs to be driven home to policy makers. Politicians are fond of stating that they need more certainty before they are willing to get on board with mitigation efforts, while economists overwhelmingly conclude the opposite- uncertainty increases, rather than decreases, the value of mitigating now. So given that the costs of mitigation seem entirely manageable, while the costs of inaction seem catastrophic, why have mitigation policies not taken off? Why don’t politicians understand that uncertainty increases the need for mitigation, rather than decreases it? Why is the concept of a little short-term pain, for long-term gain so alien to politicians? And what will it take for them to change their attitudes?